Picture by Gretchen Quarterman for Lowndes Area Knowledge Exchange (LAKE), Valdosta, Lowndes County, Georgia, 27 February 2013. Most boards post an actual agenda on the door, but this one is just an announcement. If they posted that on their website or their facebook page I can't find it. Gretchen says they did have a quorum ( unlike last month) and they were quite welcoming of her and the LAKE video camera. However, they did not provide her with an agenda. She says they didn't give anything to the VDT reporter, either. Last week I went to the Rainwater Conference Center to attend the Valdosta-Lowndes County Conference Center & Tourism Authority Board Meeting. I had discovered the time and date of this meeting by asking at the information booth at the Conference Center one day when I was there for another event. I arrived slightly before the 8:00 appointed time and was greated warmly by Councilman Tim Carroll and Conference Center Director Tim Riddle. Being the Conference Center, they served a hot breakfast (other morning boards have fruits and sweets but this was something that you might get up for). Update 2013-01-23 8:46 AM: They did at least part of the minimum and posted a notice on the door. How do we know the Valdosta Lowndes County Conference Center and Tourism Authority (VLCCCTA) meets this morning at 8AM? Gretchen asked when she picked up a list of its current board members. And did I get the right Rick Williams in that picture? That one is Pastor of Northside Baptist Church. Is he the same Rick Williams who is Vice Chairman of VLCCCTA? (Google didn't find any pictures for Chairman Rob Evans.) If it's an honor and a privilege to serve on an Authority, shouldn't the Authority tell us who is serving, instead of making us guess? The County Commission continues to do the peoples' business in secret. The solid waste exclusive franchise agreement was tabled for a month, due to some mysterious new information, and two citizens pleaded with the Commission to reconsider the whole thing. The developer who got to speak at Monday's Work Session asked for his development to be tabled for a month, and the Commission did so. After the meeting, three people from Moody AFB trooped into a side room with the Chairman. Also, if it's a privilege to serve and an honor to be appointed, why does the Lowndes County Commission not tell us who they are appointing? In the Work Session they muttered some proposed names unintelligbly, and in the Regular Session they didn't say anything about who some of the new appointees are, and none of the appointees spoke. As near as I could tell, only one bothered to show up: VLCIA reappointee Mary Gooding. Update 2012-11-20: Jody Hall reminds me he was there as an appointee. He says he was ready to speak, but nobody asked him to. Valdosta, Lowndes County, Georgia, 13 November 2012. Here's the agenda again, this time with links to the videos plus a few notes. Monday morning the Lowndes County Commission considers and Tuesday evening votes on members of five appointed boards. Who are the candidates? The agenda doesn't say. The two rezonings are the same ones the Planning Commission recently considered. Presumably the solid waste ordinance has something to do with the recent privatization decision. WORK SESSION, MONDAY, NOVEMBER 12, 2012, 8:30 a.m. REGULAR SESSION, TUESDAY, NOVEMBER 13, 2012, 5:30 p.m.
Who is on the Tourism Authority Board, and why do they have such rapid changeover in executive directors? The Commissioners considered Monday 9 January and made Tuesday 10 January three appointments to the Tourism Authority: Commissioner Joyce Evans (reappointment), Jerome "Andy" Anderson (reappointment), and Greg Charbeneau apparently to replace Linda Jenson (who had been appointed to fill a vacancy for ? Montgomery). Valdosta, Lowndes County, Georgia, 10 January 2012. 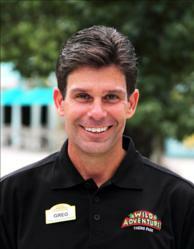 According to Wild Adventures' own press release of 29 July 2011 and the VDT 14 August 2011, Greg Charbeneau is also their general manager. Valdosta, Lowndes County, Georgia, 9 January 2012.